I'm working on applying the finish to the Cello guitar and Tenor ukulele. Always a bit of a slow process and while that is going on I am starting on the next projects. in this case 3 guitars, based on the Gibson L-0 6 string. All 3 will have Sitka tops but that is about where the similarity stops.. 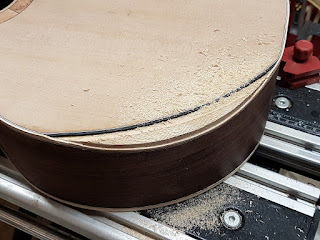 The closest to a classic L-0 will have my view of the Gibson H bracing with a White Oak back and sides and Spanish Cedar neck. 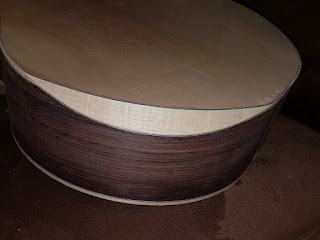 The next will have a pretty standard Martin influenced X brace with Walnut back and sides and a Mahogany neck and the last will have a double X brace with Koa back and sides and a Mahogany neck. It will be interesting to see how they all sound.. The double X brace design will I think become what I use going forward. The trickiest part of the arm bevel is getting it shaped and smoothed down right to the purfling lines on the top and side. Then of course the veneer needs to be glued on tight..